Earnshaw is the only player to score a hat-trick in the Premier League, FA Cup, Championship, League One, League Two, League Cup and an international. He also holds the record for goals in a season (35) for City as they won promotion via the play offs in 2003 from League One to The Championship. 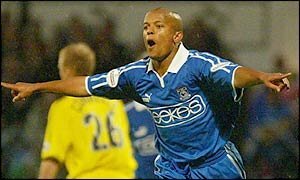 Spells in the Premier League and moves to several clubs in the UK, back on loan at Cardiff and finally the MLS along with 59 international appearances incuding a goal against Germany on his debut, means Earnshaw has had a very varied and very successful career. Makes me feel old that I can remember seeing this youngster start his journey at Cardiff, ripping up defences with his pace, finishing, trademark somersaults and a confidence in his ability that belied his young age. Earnie ended his playing career at Vancouver Whitecaps this week and stays with the club in a new coaching role. In an open letter on the Vancouver website, Earnshaw said: “I have fond memories of watching my mum play football in Zambia and then in Malawi where I went to school, making footballs with plastic bags, having crocodiles as school pets, and living in an African coal mine village. “I was raised by my mum, who was working two jobs and still managed the time to support me. I have no doubt that this is where I get my energy and drive. I lost my father when I was nine so I never had a father figure. “In a way, football has been like a father to me. It has taught me about life, about working hard and staying focused. Football has taught me about the world, about religion, nationalities and communities, and how regardless of our numerous backgrounds we can all come together to play a game we all love. “From kicking footballs against our garage door in Caerphilly, Wales, to growing up and playing in the English Premier League, to gracing the international stage with Wales – I’ll never forget any of it. "Being able to represent every fan and every football supporter in Wales 59 times, and scoring the winning goal against Germany on my debut are great moments I share with my country and are truly special to me.